Present state: The main station building survives and is in use trading as the 'Old Station Garage'. The station master's house is in private occupation. Construction started in 1879 but the money quickly ran out and the South Eastern Railway appeared to have lost interest. Despite this, a second Act was obtained in 1882 for a 1.5 mile extension from Cranbrook to Hawkhurst and eventually the South Eastern Railway agreed to support the line in order to prevent their arch-rival, the London, Chatham & Dover Railway, from gaining a foothold in what they regarded as their territory. Further delays meant that it was twelve years before the line was ready for passengers, the first section, from Paddock Wood to Hope Mill for Goudhurst & Lamberhurst opening on 1 October 1892. Nearly a year passed before the final part of the line came into service, the extension to Hawkhurst via Cranbrook opening on 4 September 1893; on the same date Hope Mill was renamed Goudhurst. Holman Stephens, later known as Colonel Stephens, was the resident engineer during construction. The line was single throughout, with passing loops provided at all three intermediate stations, though only Goudhurst had two platforms. A short bay platform was provided at Hawkhurst. The Sentinell-Cammell steam railbus originally used on the Brighton-Devils Dyke branch put in a brief appearance in 1936 but was not a success. Goods traffic was mainly fruit and hops outwards and coal inwards. One mainstay was the transport of a million potted plants a year on behalf of F. W. Woolworth to branches all over the country. From the outset all train services were operated by the South Eastern Railway, though the Cranbrook and Paddock Wood Railway was not officially absorbed until 1900. The SER and the LCDR combined in 1899 under agreement that both companies would retain their independence while being administered under a management committee operating as the South Eastern & Chatham Railway. The LCDR was itself incorporated into the Southern Railway under the 1923 grouping and finally British Railways after nationalisation in 1948. From the offset traffic on the line was light, due in part to the inconvenient locations of stations. Extra traffic was generated during the hop picking season which, at its height, brought up to 26 special trains a day with each train carrying up to 350 people. By 1959 this traffic had declined and the line was carrying less than 200 passengers a day, many of them children. The final blow came when the local education authority took out a contract with the Maidstone & District Motor Company to transport the children by bus. 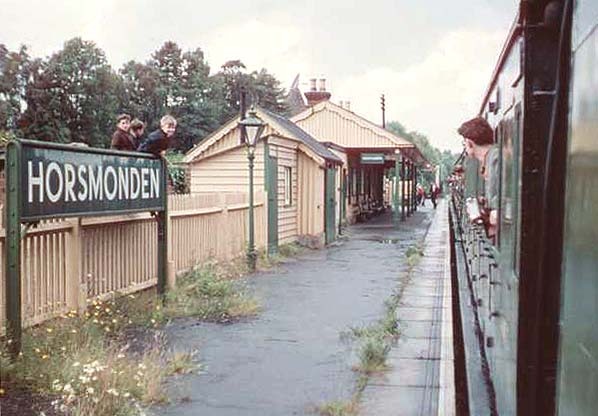 Despite rumours of electrification, closure was announced and the line finally closed on 12 June 1961. On the following day a 'Farewell to Steam' tour organised by the Locomotive Club of Great Britain visited the line and was the last public train to run into Hawkhurst. 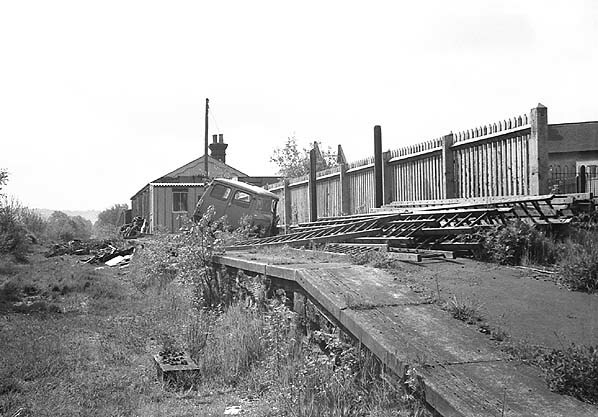 The track was lifted in 1964 and in 1967 the station sites were offered for sale. 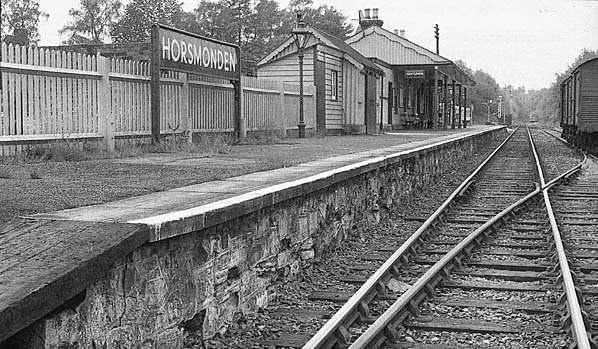 Horsmonden Station had a single platform located on the up side of the line. The station was provided with a loop which also served a fruit packing station. The station had a single storey corrugated iron clad building, typical of those built by Col. Stephens. There was a two road goods yard at the back of the station with a three storey brick stationmaster's house facing onto the road.